(Newser) – Based on a line in a local history book, Jude Plum suspected the two-story home he purchased out of pre-foreclosure in 2013 was old. 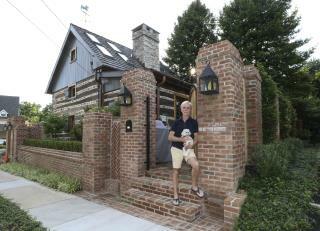 He just didn't know it was one of the oldest surviving homes in Pennsylvania. That fact, and more of the home's history, surfaced only when Plum peeled back five layers of exterior to find a hand-hewn log frame untouched since 1704, making the home one of the two oldest standing houses in Lower Merion Township, reports the Philadelphia Inquirer. Located on a busy road in Bryn Mawr, the log home next to Plum's childhood home is believed to have been built by a Welsh Quaker who purchased hundreds of acres of land from William Penn in 1682. It was then covered in clapboard sometime in the late 1700s. Lookit the tiny little doggy!! Squee! I would have done some cheap repairs and flipped it. Lovely but are those solar panels on the roof? Kind of takes away from the experience.